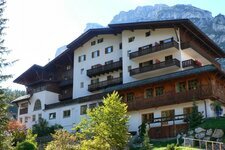 The famous Sella Ronda is a ski circuit round the fabulous Sella alpenstock and a great winter holiday experience. The Sella Ronda, run in clockwise direction, starts in the village of Corvara with a spectacular funicular ride. Once reached the Piz Boè mountain station you can enjoy the great view on the Dolomites. First the route leads towards the Passo di Campolongo, a 1,875 m high mountain pass between the Sella Group and the Fanes group. This double chair lift takes you to the Malga Ciapela hut and Mt. Marmolada - here we are at 2,150 m asl. A fabulous sun terrace with a great view and local delicacies, that’s what several mountain huts round the Sella alpenstock offer. Saoking up the sun and admiring the snow-covered rocks of the Dolomites, a real winter dream. The Funifor Arabba - Porta Vescovo Funicular overcomes an altitude difference of more than 800 m.
Skiing down from Portavescovo towards Pont de Vauz: also in spring the slopes are in a perfect state. The circuit proceeds towards the Passo Pordoi and the Val di Fassa valley. The mighty Sassolungo Group, a mountain range that is also part of the Dolomites. Between Mt. Sassolungo and the Sella alpenstock… in fact, you can also do the Sella Ronda with your snowboard, even if some rather plain parts are less advantageous for snowboarders. Lunch-hour at the Rif. Salei mountain hut close to the Passo Sella pass - soak up the sun and regain your strength! Skiing at the Passo Sella, a 2,218 m high alpine pass, offering a fabulous view on the rock faces of the Dolomites. Stop and have a drink, there are many possibilities round the Sella alpenstock, e.g. the Rif. Emilio Comici mountain hut. Skiing down from Mt. Piz Sella to the Val Gardena valley, one of the few rather steep slopes. The Piz Sella Funicular hovering above the rough peaks of the Dolomites. Spots of colours in the blue winterly sky - the Colfosco Funicular. Slowly we approach the starting point of the Sella Ronda in Corvara. Colfosco offers a series of skilifts in the Edelweiss Valley (Valle Stella Alpina), offering a great view on Mt. Sassongher as well as the Val Mesdí. After a day on skis we reach our starting point at the valley station of the Boé Funicular in Corvara. Sella Ronda, that’s how the popular tour on skis round the Sella Group in the Dolomites is called. Already in times when there were hardly any streets and no lift facilites in the Alta Badia, the Sella Group was partly surrounded on skis by the inhabitants of the Dolomite valleys, a way to reach the single areas. However, today the Sella Ronda is a very popular tour on skis in the great scenic landscape of the Dolomites and truly unique. The circuit features a length of about 40 km and includes four Dolomite passes: Gardena, Sella, Pordoi and Campolongo. The Sella Ronda can be started in Corvara, Canazei, Selva Gardena or Arabba - an early start is recommended as the tour takes a whole day (min. 6 hours) and the lift facilities close in the late afternoon. You can ski the Sella Ronda in clockwise direction (orange markers) as well as counter clockwise (green). A suggestion: make a quick side-trip to the Alpine Ski World Cup slopes of Gran Risa in La Villa (Alta Badia) as well as Saslong in Santa Cristina (Val Gardena valley). The lift facilities and skiing areas of the Sella Ronda are all included in the Dolomiti SuperSki Pass!